The Battle of Atlanta in July 1864 was a turning point in the war. Because Atlanta was a critical railroad hub, integral to supplying the Confederacy, the Union determined that ultimate victory would necessitate severing that link. Still, in 1864 many Northerners didn’t believe the war could be won. But with the North’s victory in the Battle of Atlanta, President Abraham Lincoln’s reelection—unlikely up to that point—was secured. While the Atlanta battle was one of the Civil War’s 10 bloodiest, it’s the only one of the 10 without a single acre of officially preserved battlefield. 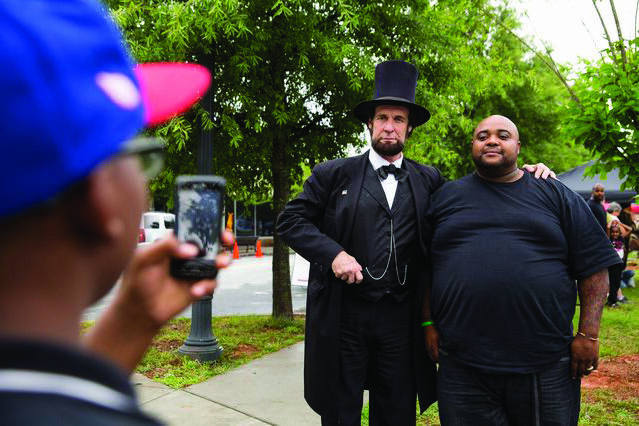 Preservation was on Bryant’s mind when he and his neighbors started B*ATL events in 2004. Georgia Humanities began supporting the program in 2009, with 2014 marking the culmination of activities. B*ATL organized local neighborhoods around the old battlegrounds to commemorate the event with a “living-history” encampment (complete with front lines, reenactment soldiers, and artillery), a 5K run, a gala dinner, historic bus/bike/walking tours, a “Civil War to Civil Rights” tent, author talks, children’s activities, storytelling, and dramatic performances. Bryant and his group were some of the very early champions of the “Civil War to Civil Rights” idea—ultimately a statewide initiative to capture and share events and programs that explore the connections between these periods of American history.